Georges Bizet, pianist and composer, was born on October 25, 1838, in Paris, France and died on June 3, 1875 in Bougival (near Paris), France. He was a composer in the Romantic Period (1825-1900) in music, and is known today mainly for his Operas. Carmen, written 1873-4, was his last Opera. Carmen is an Opera in four acts, set in Spain, about the title female character named “Carmen”. Opera is the plural of Opus (“work” in Latin); Opus numbers (e.g. “Opus 74” or “Op. 74”) are often used by composers to identify a piece. An Opera is the union of music (singers - soloists and chorus - with orchestra), drama (acting and often dancing) and spectacle (theatrical setting with costumes, sets, etc.). A Suite is a collection of music taken from a larger work, such as an Opera. There are two suites of music taken from Carmen (Carmen Suite No. 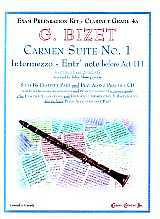 1 & Carmen Suite No. 2) edited by Fritz Hoffmann, based on Bizet’s original opera score. Intermezzo is a light instrumental piece performed between the acts of a serious Opera or Play. Entr’ acte is any instrumental piece performed between the acts of an Opera or Play.